Verizon's Flash-based web promo presented a series of mouse-over animations that highlighted the big new phone's 4.3 inch display and HDMI output (a hardware feature still missing from any of Apple's iOS devices). However, it also specified the new model as having a "720p screen," leading some sites to report that the new phone "might carry a resolution of 1280x720 pixels." The actual resolution of the new Droid X is 854x480, the same resolution as the original Droid released last winter, but on a bigger screen that delivers less pixel density. A variety of new Android phones are now targeting the supersized 4.3 inch screen form factor (including Sprint's HTC Evo), hoping that customers will be impressed by girth rather than screen clarity, quality and manufacturing competency. In its race to differentiate itself in the Android landscape, HTC's Evo has raced to market features including 4G networking, a WiFi hotspot, Adobe Flash support, and video calling, all things that iPhone 4 does not do. While Evo hardware features sound great, the advertised numbers (like Verizon's inaccurate "720p screen") and features of Android phones aren't necessarily living up to their hype. For example, the HTC Evo really only supports WiMAX 802.16e, not the minimum WiMAX 802.16m standard that is the actual minimum for classification as a 4G network, making its claim to be the first 4G phone dubious. Sprint doesn't even offer 4G in many cities, and even in the few where it's available the service inhales extraordinary battery life.
] And beware: the hot spot feature costs an extra $30 a month." In regards to Flash, Pogue clarifies that "Evo runs something called Flash Lite, which is marketing-ese for, 'Sometimes works and sometimes doesnt,'" noting that while it plays some videos that iOS devices can't, it mostly just delivers all the blinking ads on the web while it doesn't work with a variety of other Flash videos and content, including CNN and Hulu content. And as for Evo's video calling, Pogue notes, "this feature is head-bangingly unstable. After two days of fiddling, downloading and uninstalling apps, manually force-quitting programs and waiting for servers to be upgraded, I finally got video calling to work  sort of. Sometimes there was only audio and a black screen, sometimes only a freeze-frame; at best, the video was blocky and the audio delay absurd." Making calls requires installing third party software, unlike Apple's FaceTime solution. The hardware-centric hype of Android is being used to make up for major deficiencies in Google's Android OS itself, writes Jack Shedd, who documented his own experiences with Android before giving up and making plans to head back to the Palm Pre. "Theres a sense, not just from reviewers, but from fans of the device, that what Android really needs is just killer hardware," Shedd wrote. "Which is just absolute horse [poo]." "Ive been subjected to every inconsistency, idiocy and poor quality of thought Android has to offer," he complained. "Every 'unique to Android' feature seems, at best, a technological demo. Best I can explain it, Android is how an iPhone would work if Google designed it." Screen resolution has been a notable exception where Android phones were decisively leading Apple's offerings, at least until the comparison changed from last year's iPhone 3GS to the new iPhone 4. Last winter's Verizon Motorola Droid introduced a 854x480 resolution screen with a density of 265ppi, significantly higher in both resolution and pixel density than last summer's iPhone 3GS and its 480x320 screen with a 163ppi density. However, Apple is now launching the new Retina Display of iPhone 4, which delivers a resolution of 960x640 at a density of 326ppi. New Android big-screen models such as the Evo and Droid X don't deliver higher resolution screens, they're just bigger, much like the Nintendo DSi XL, a fact that seems ironic given all the pundits' contempt that was shoveled upon iPad for being "just a big iPod touch," despite introducing a much higher resolution display. The larger screens at the same resolution now being promoted on the new big format Android phones means less pixel density and more obvious pixelation. The pixel density on the Evo and Droid X drop to 217ppi when their 854x480 resolutions are stretched across their larger screens. OLED displays like that used on the HTC Evo present even less accuracy when stretched out, compared to Google's Nexus One, due to their use of skipped subpixels. 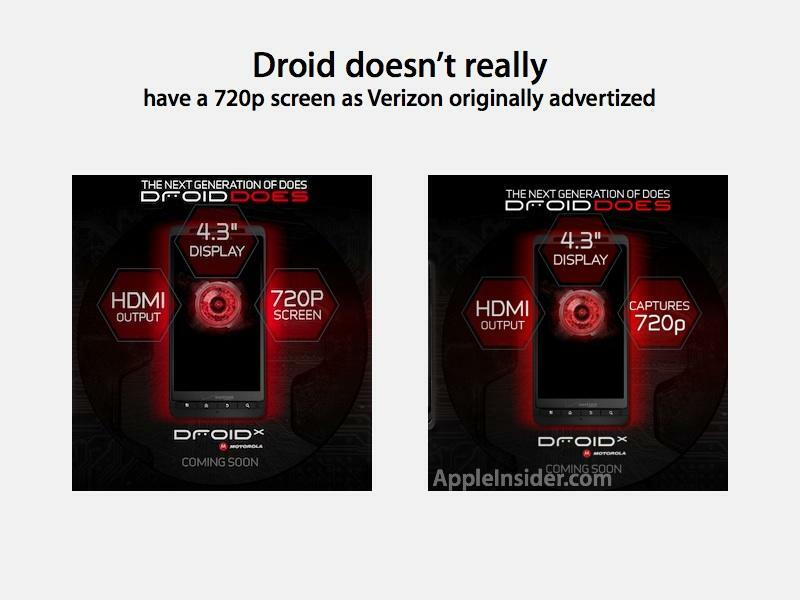 That's not a problem for the Droid X because it uses the same TFT screen technology as the iPhone 4 and iPad, just in a lower resolution. However, with Apple stealing the high resolution crown from Android, there's little left to recommend the less polished, less secure, less integrated, and more frustrating experience that Android offers.